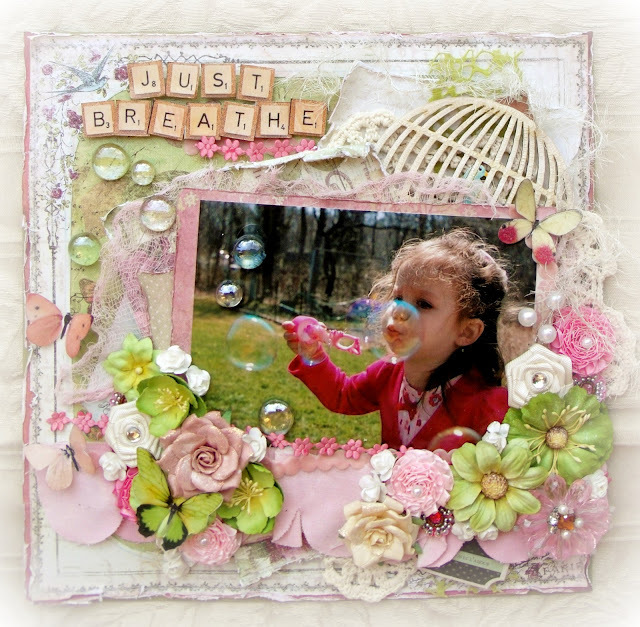 lifetime of pages: Just Breathe-Scrapping the Music Winner ! Just Breathe-Scrapping the Music Winner ! There were so many gorgeous entries ! "Do you ever listen to a song and get caught up in the words....lost in your thoughts and emotions? Music can inspire and release creativity in all of us. Scrapping The Music was created as a pure means of inspiration for creating scrapbook pages, art journal pages or any other art project from the heart. Each week we will choose a song for inspiration. Your challenge is to use this song to create something full of passion, emotion, or just pure fun"
Thank you to the Design Team and can't wait to see the song pick for the April 1st Challenge ! This is Abby, my Pastor's daughter-she is a hoot and a half! I have never seen so much energy and joy exuding from one little girl. What a fresh breath of Spring! And aren't you clever with the marble bubbles!! I love them. This is just a beautiful layout! Oh my this is stunning! It makes me want to play in the flower garden! Jaw dropping gorgeous!! Love every inch Tracey!! Wow - this is beautiful Tracey! What an awesome take on the STM song! I especially love the bubbles! Thanks for playing along with us at Scrapping the Music! Yay Tracey!!!!! I love this page and that you joined us at Scrapping the Music this week! Isn't it a great song to scrap to? Your page is just fabulous - the photo is so amazing, happy, and fun! Your design blows me away!!!!! P.S. I think I have told you this before, but if I haven't . . . I love your beautiful blog, too! This looks like MAGIC, the bubbles are going on on the paper!! I love all those flowers and colors, and the picture is so sweet. What a cutie!! You must be the winner!!! Marble bubbled?! So clever...this is gorgeous...love that little energetic photos of your pastor's daughter and the clusters of flowers and goodness!